Atria Books To Publish New York Times Bestselling Author Isabel Allende | News and Corporate Information about Simon & Schuster, Inc.
(NEW YORK) – March 9 , 2015. 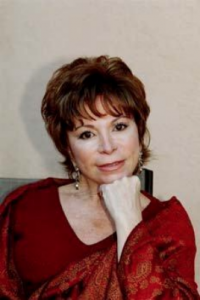 Atria Books today announced they will publish one new book and release four backlist titles from New York Times bestselling author Isabel Allende. Allende’s books have been translated into more than 35 languages and have sold more than 65 million copies worldwide. Atria Vice President and Executive Editor Johanna Castillo acquired World English rights from Ms. Allende’s literary agent Carmen Balcells at the Agencia Literaria Carmen Balcells S.A.
Allende’s new novel, The Japanese Lover, will be published this fall. It moves back and forth between present day San Francisco and the years of the Second World War in Poland and the United States. It is a tender, multi-generational love story that explores issues of race and identity, abandonment and reconciliation. With an intricate and gripping plot that takes readers inside the US internment camps where Japanese Americans were imprisoned during the war, the novel captures both the horrifying acts and beautiful deeds of which mankind is capable. “I am delighted to become an Atria author. My recent novel, The Japanese Lover, could not be in better hands. I think my new publisher will open new venues and gain new readers for my work,” says Isabel Allende. “Isabel Allende is an iconic writer whose work will endure and inspire many generations to come,” says Johanna Castillo. “Her new novel, The Japanese Lover, evoked the same sense of enchantment I felt when I first read The House of the Spirits.” Isabel Allende won worldwide acclaim when her bestselling first novel, The House of the Spirits, was published in 1982. In addition to launching Allende’s career as a renowned author, the book, which grew out of a farewell letter to her dying grandfather, also established her as a feminist force in Latin America’s male-dominated literary world. She has since written twenty more works, including Of Love and Shadows, Eva Luna, Stories of Eva Luna, The Infinite Plan, Daughter of Fortune, and many others. Books of nonfiction include Aphrodite, a humorous collection of recipes and essays, and three memoirs: My Invented Country, Paula (a bestseller that documents Allende’s daughter’s illness and death, as well as her own life), and The Sum of Our Days. Her works entertain and educate readers by weaving intriguing stories with significant historical events. Settings for her books include Chile throughout the 15th, 19th and 20th centuries, the California gold rush, the guerrilla movement of 1960s Venezuela, the Vietnam War, and the slave revolt in Haiti in the 18th century. In addition to her work as a writer, Allende also devotes much of her time to human rights. Following the death of her daughter Paula in 1992, she established in Paula’s honor a charitable foundation dedicated to the protection and empowerment of women and children worldwide. Allende has received dozens of international tributes and awards over the last 30 years. In December 2014, President Obama awarded her with the Presidential Medal of Freedom. Since 1987, Allende has made her home in California with her husband, attorney and author William Gordon, and their extended families. Allende became a U.S. citizen in 1993 but, as she says, she lives with one foot in California and one foot in Chile. The book will be published by Simon & Schuster in the UK, Australia and India.